Hawkish monetary policy rhetoric has enveloped financial markets, and particularly currency markets, over the past couple of weeks. High volatility has prevailed, even within the most developed currencies. The Bank of Canada was the exclusive major developed economy to have ‘walked the walk’, and raise interest rates earlier this month. 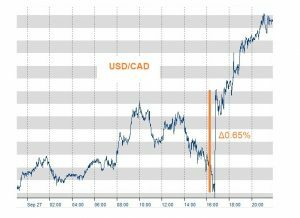 This article analyses Bank of Canada Governor Stephen Poloz’s St John’s Board of Trade speech today and its impact upon the Canadian Dollar. Here we consider the speech having contextualised Canadian monetary policy in Part One. Today, Stephen Poloz, Governor of the Bank of Canada, spoke at the St John’s Board of Trade. The Governor’s tone appeared to have partially internalised this fact. Speaking about the supremacy of the price level when determining monetary policy, Dr. Stephen Poloz spoke of a target rate of 2% annual inflation, however, a wider permissible band of 1%-3%. Moreover, Poloz praised and justified the monetary policy stimulus that the Bank of Canada provided in 2015. There appeared to be a dichotomy, even a paradox, within Dr. Poloz’s Board of Trade talk. Speaking about the decision-making process of the Bank of Canada, the Governor spoke about the primacy of economic models. However, he mentioned that any use of economic models is conditioned by judgement, most of which is informed by “conversations with people”. Invoking ideas of a pragmatic and holistic policy-making process, the speech aimed at showing the stability and responsibility of the Bank. The paradox or confusion arises from the Governor’s conclusion: “we could still be surprised in either direction” and monetary policy will be “particularly data dependent”. Seemingly in conflict with the sentiment throughout the speech, Poloz admonished listeners that “there is no predetermined path for interest rates”. Much of the confidence in the capacities of a central bank, particularly when threatened by extra-ordinary monetary policy circumstances, is from an anticipated, stable and forecasted monetary policy. Forecasting expected interest rates hikes, as for example the ECB, the Bank of England and the Fed rely upon heavily, allows markets to internalise and price in the effect you want to see in the market before central bank action. In effect, therefore, the actual monetary policy stimulus or tightening must only be announced, not even effected; if banks internalise a deposit rate hike, they will begin to normalise it within the interbank rate at the forecasted, internalised level. Therefore, to claim the data dependence of monetary policy and to admit there is no forecast for interest rates may be viewed by some as central bank suicide. The two-fold effect of an internally conflictual speech alongside a lack of predictability regarding future rate movements may inject uncertainty within the market and, ultimately, undermine confidence within the Canadian central bank. It is therefore unsurprising that the Canadian Dollar suffered strongly during this announcement. During Poloz’s speech, the Loonie fell by around 0.65% against the US Dollar, the most significant currency cross when considered on a trade weighted and current account basis. The currency continued to depreciate against the US Dollar throughout the late trading session, perhaps whilst the uncertainty and low-confidence took hold. These shifts are visible in the chart below. The conclusions emanating from the Bank of Canada suggest that the Canadian Dollar will be more volatile when hard data announcements are made. Whilst this increases risk, the importance and value of integral analysis on the Canadian Dollar similarly increases. Whilst markets currently price the probability of a further 2017 rate hike pessimistically following the speech, data, particularly CPI inflation, will shock the value of the Loonie over the coming months. Once again, the environment that those trading within Canadian Dollar will face increases the value of currency hedging.